Cross Hackathorne of Fairbanks goes up for a basket in this file photo. Hackathorne tallied 19 points during the Panthers’ victory at West Liberty-Salem on Tuesday. 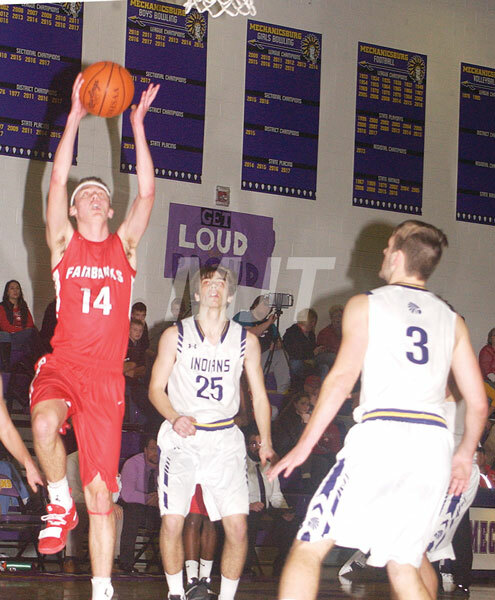 The Panthers of Fairbanks climbed to a 17-6 lead after the first period and went on to top West Liberty-Salem, 61-44, on the Tigers’ home court Tuesday. West Liberty-Salem tallied 17 markers during the ensuing set, but FHS (16-2) held a 33-23 margin at halftime. FHS (which will host Mechanicsburg for Homecoming on Friday) took a 49-36 advantage into the final stanza. Cross Hackathorne led the Panthers with 19 points, while Braylon Green added 15. Hackathorne 8-2-19, Green 7-1-15, Nicol 3-0-9, Smith 3-2-9, Beem 3-0-7, Miller 1-0-2. Totals 25-5-61. Three-point goals: Nicol 3, Hackathorne 1, Smith 1, Beem 1. Nease 6-1-15, Eggleston 3-1-11, McGill 2-1-5, Burden 2-0-4, Siegenthaler 1-0-3, LeVan 1-0-3, Van Horn 1-0-3. Totals 16-3-44. Three-point goals: Nease 2, Eggleston 2, Siegenthaler 1, LeVan 1, Van Horn 1. North Union’s boys varsity hoopsters upped their record to 10-8 by rolling past Cardington, 77-57. The Wildcats (who will travel to Benjamin Logan on Friday) jumped out to a 20-7 lead by the end of the first quarter. NU’s advantage stood at 38-25 by halftime and 60-37 after three quarters. Preston Crabtree led NU with 22 points and was joined in double figures by Harley Day-16 and Connor Terrill-15. Also scoring for North Union were Joel Krebehenne-seven, Koldan Wiley-five, Trevyn Feasel-four, Aaron Krebehenne-four, Gavin Webb-two and Zach Vernon-two. Jackson Izzard’s three-pointer inside of half-court gave Jonathan Alder a buzzer-beating 44-41 victory over St. Francis DeSales. Izzard led JA (14-3) with 20 points that included 18 from beyond the three-point arc. He sank four shots from three-point land during the fourth stanza, including one to tie the game at 41-all with a little more than a minute left to play. DeSales held a 13-9 margin after the first quarter and took a 21-17 lead at the turn. Alder, which will host Kenton Ridge on Friday, battled back to within 31-30 by the end of the third period. Izzard 7-0-20, Santa-Emma 3-2-8, Walker 4-0-8, Koenig 2-2-7, Heinig 0-1-1. Totals 16-5-44. Three-point goals: Izzard 6, Koenig 1. Righter 4-0-10, Watson 4-0-9, Sciarroni 3-0-7, Derden 2-0-4, Bogue 2-0-4, Hawkins-White 1-0-3, Mann 1-0-3, Achirem 0-1-1. Totals 17-1-41. Three-point goals: Righter 2, Watson 1, Sciarroni 1, Hawkins-White 1, Mann 1. Marysville’s girls slipped to 9-10 with a 55-45 loss at Big Walnut. The Eagles held a 13-9 lead after the opening period. MHS trailed 17-16 midway through the ensing set. The Eagles went on a run and took a 29-16 advantage at halftime. Big Walnut’s margin stood at 45-32 by the end of the third set. MHS cut the deficit to 10 in the fourth period, but could not further close the gap. The Lady Monarchs (who will host Upper Arlington for Homecoming on Friday) were led by Caitlin Cotner, Karleigh Sutter and Tinley Graves, who each tallied eight points. Av. Schone 6-2-14, Boehm 4-2-11, Brown 3-0-9, Carter 4-1-9, Neff 2-2-6, Tatey 2-0-4, Al. Schone 1-0-2. Totals 22-7-55. Three-point goals: Brown 3, Boehm 1. Cotner 2-3-8, Sutter 3-0-8, Graves 3-0-8, Cook 2-2-6, Francisco 2-0-6, Daniel 2-0-4, K. Lee 1-1-3, S. Lee 1-0-2, Brown 0-0-0. Totals 16-6-45. Three-point goals: Graves 2, Sutter 2, Francisco 2, Cotner 1. The Cardinals slipped to 0-20 overall and 0-14 in the Ohio Heritage Conference with a 44-39 loss to Mechanicsburg. Triad (which will travel to Northeastern on Friday) managed just 15 points during the first half, but still deadlocked the score at the turn. The Indians took a 31-28 edge into the final period and held on for the win. Dillon Nott led the Cardinals with 11 points. Taylor 5-3-17, Hurst 2-6-10, Mascadri 3-1-7, DeLong 1-2-4, Smith 1-1-3, Edwards 0-2-2, Hall 0-1-1. Totals 12-16-44. Nott 4-1-11, O’Neal 3-2-8, Thompson 2-1-6, Campbell 1-2-5, Simonelli 1-2-4, Lease 1-2-4, Bails 0-1-1, Bundy 0-0-0. Totals 12-11-39. Three-point goals: Nott 2, Thompson 1, Campbell 1.